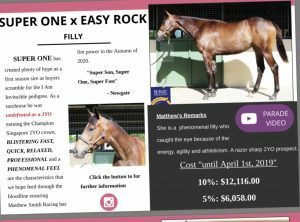 Girls, here are 2 more “girls only” groups being put together with Matthew C Smith Racing Pty Ltd with horses purchased from this year’s magic millions. 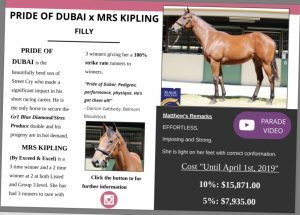 Prices are attached and you can read all about the breeding. We plan on having loads of fun with this stable as we already have a horse with a group of my “girl” friends. If you have say 5 friends, there is another way you could have fun. Take 5% with your 5 friends and have lunch while you set up your own syndicate name and you then run under this name. Just know that you will need to set up an account together and put so much in each week. The share is really only entitled to 1 ticket on race day for this share but if in a large stable and on a non carnival day, the chances are (if you are very nice to your trainer) more tickets could be obtained. Happy to talk you thru this. And I would absolutely love to come to your lunch!!!! Hear from Mel Smith on how women are being embraced now in this industry.